Sophie Cavanaugh is not going to let her freak of a cousin's strange psychiatric condition ruin high school for them both. Not after all the work she's put into cultivating the right look, and friends, and reputation. But then, Sophie sees something so frightening she lets out a blood-curdling scream—and finds herself stuck in a bizarre parallel world where nothing is safe and deadly creatures lurk just out of sight, waiting for her to close her eyes and sleep...forever. This was a fun little novella! I enjoyed getting to know Sophie better. She's always been such a bratty little thing, in my opinion, and a very one-dimensional character. But, Never to Sleep changes things. I got to see another side of Sophie, one that I respected and admired. She's actually quite the fighter. What she does to get herself out of a dangerous situation really surprised me. Sophie doesn't wait to be saved, she saves herself! Which, based on what I thought I knew about Sophie, surprised me. I also like the intrigue of Sophie being "more than" human. That fact is definitely piquing my interest for book six of the Soul Screamers series. Never to Sleep also introduces a new character to the series, named Luca. He is intriguing to say the least. And maybe a replacement for Sophie's ex, Scott? 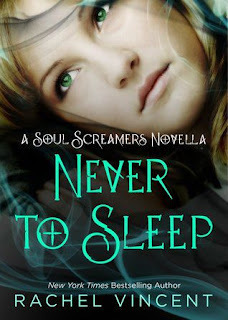 My one complaint about this novella (and, in fact, all of Rachel Vincent's Soul Screamers novellas, now that I think about it) is that the ending was so choppy. Just, boom, and you're done. I would have liked a little more to the story. Overall, I did enjoy Never to Sleep. I think it is a great addition to the series, and at $1.59 for Nook, a steal. I was left wanting more of the Soul Screamers world after finishing If I Die, and Never to Sleep delivered. I got a good story, a closer look at a main character, and a sneak peek of a new character. I'm all ready for book six now!